GENEVA - The Euro-Mediterranean Monitor for Human Rights is deeply concerned by the military operation launched by the retired General, Khalifah Haftar’s troops, to take control of several areas to the west of the country, including the capital Tripoli, calling on the international community to pressure Haftar to withdraw his forces and to favor dialogue over military solution. On the 4th of April, hundreds of military vehicles and thousands of Haftar's militants advanced towards Tripoli, where violent clashes broke out in several areas near the capital, in which the internationally recognized government of National Reconciliation was engaged, causing dozens of deaths and injuries from both parties, the Euro-Med said. According to family sources, the Euro-Med noted that a woman and her daughter were killed when a rocket hit their home in the Qasr bin Ghashir area, south of Tripoli, as well as the killing of doctor Ayman Haramana with two bullets as a result of the continuing clashes in Wadi Alrabie area south of the capital. 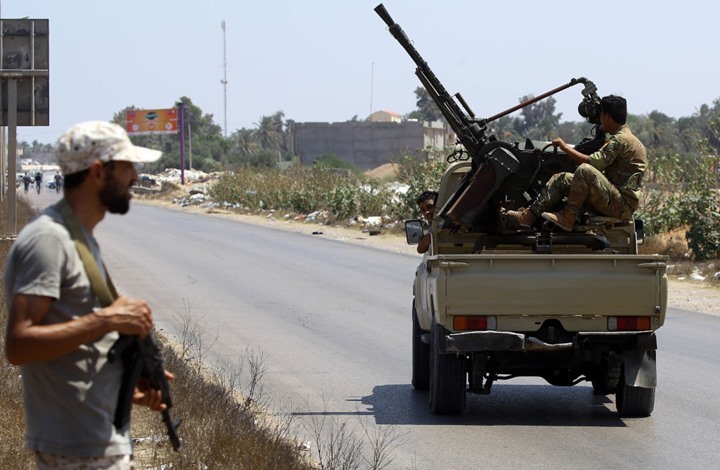 The Euro-Med added that its field team documented on early Sunday, 7th of April, the targeting of Haftar’s forces of residential areas to the south of Tripoli, specifically the areas of Salah al-Din and Khallet Alforjan, using indiscriminate rockets, which pushed dozens of families to move towards safer areas in the center of the capital. According to the Ministry of Health of the National Reconciliation Government, On the 7th of April, seven civilians were killed, and 55 others were injured, and dozens of houses were damaged as a result of the ongoing clashes as well as fire caused by a rocket since the start of the attack on the capital on the 4th of April. The armed clashes broke out at a time the UN Secretary-General was visiting the Libyan capital where he met with the head of the National Reconciliation Government, Fayez Al-Sarraj, to discuss the preparations for a comprehensive national meeting which was to be held in the middle of April at Ghadames in an attempt to find a formula of understanding between all Libyan parties, said the Geneva-based NGO. The seven major industrial powers urged all parties in a statement to stop actions that would exacerbate the conflict in the country, calling on great powers to use their influence to press for an immediate cessation of military actions in Libya. The spokeswoman for the Euro-Mediterranean Monitor, Sarah Pritchett, said that all parties should opt for dialogue, an immediate cease-fire, and the withdrawal of all military units to areas of former concentration. The international community is facing a real test to force the warring parties to put things back on track, go ahead with dialogue, steer clear of using the military option and save the country an open civil war, Pritchett added. The Euro-Med underlined the need to pressure the Haftar forces to adhere to the call of the Security Council, which took place on 6 April, to discuss developments in Libya and to stop the military actions that threaten Libyan stability and prospects of the United Nations’ mediation and a comprehensive political solution to the crisis. The Euro-Med called on the parties to the conflict to spare civilians and their property the scourge of conflict, abide by the rules of international humanitarian law and the Geneva Conventions and expressed concern that civilians would pay the price for the conflict amid a deadlock in reaching a solution. The Euro-Med called on the UN mission and the international community to intervene urgently in order to prevent the expansion of the circle of fighting and to take necessary and urgent measures to punish those involved in the violations that accompany the military operations in various Libyan regions. L'Observatoire Euro-Méditerranéen des Droits de l'Homme est une organisation indépendante basée à Genève avec des bureaux régionaux en Europe et dans la région MENA.